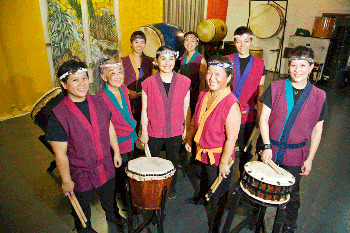 Sawagi Taiko is the first all-women's taiko group in Canada, formed in 1990. In Sawagi Taiko, we pool our common and unique experiences as East Asian women living in Canada and focus our creative energy and ideas into a powerful expression that is always heard and can't be ignored. As a performing group, we're looking to smash hierarchies and create an environment where all our members can initiate and explore their artistic visions. Taiko means big drum, and it dates back to creation myths of Japan. Throughout history, the drum has played an integral role in Japanese culture. 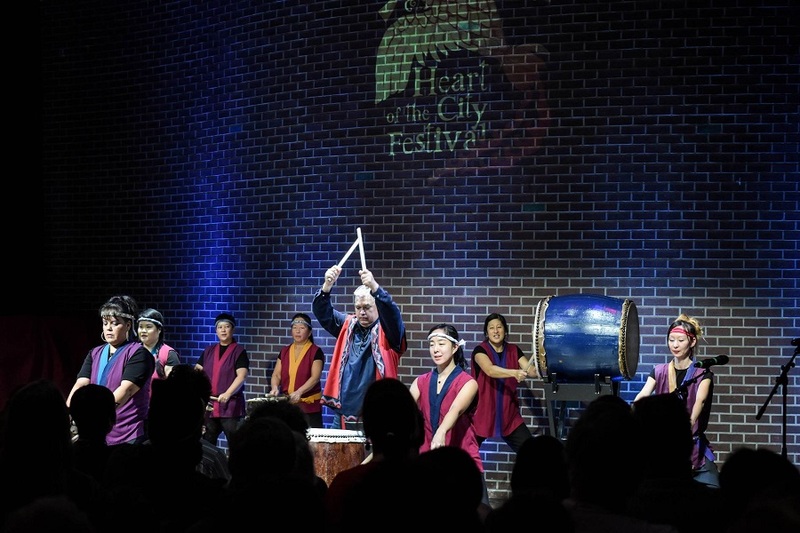 During the past 40 years, the playing of taiko has developed into an ensemble performing art. 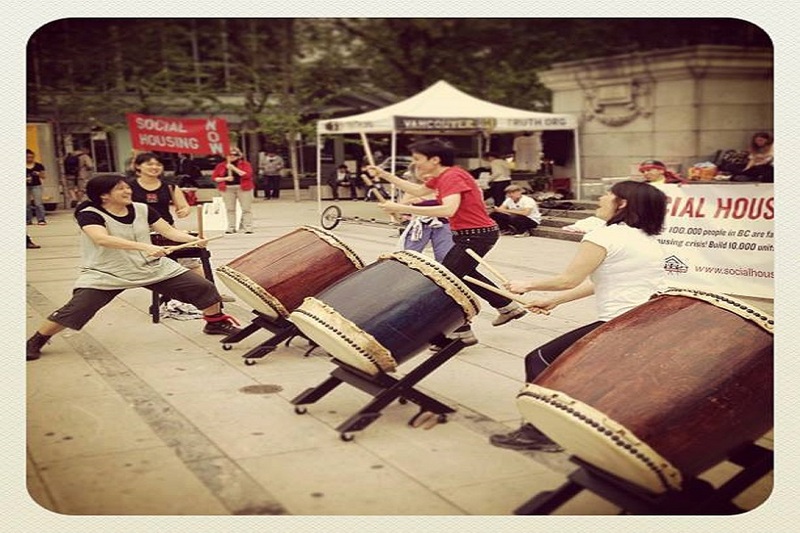 Many groups began forming in the late 1960s as young Asian Americans embraced taiko as an expression of their culture and heritage. Seiichi Tanaka, the sensei at the San Francisco Taiko Dojo, gave many of the North American groups their first workshops and taught them the basic skills of taiko. He was instrumental in the spread of taiko across North America. 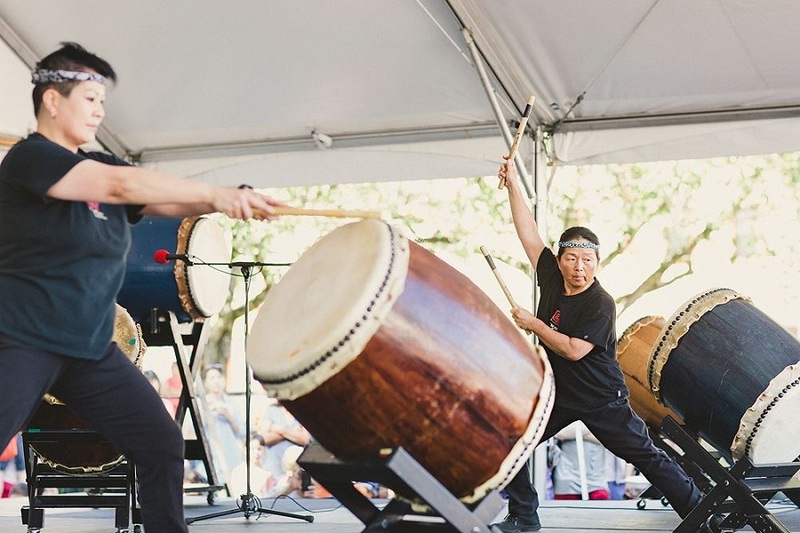 The immigrated form of Asian North American taiko is influenced by many different styles of music- Chinese, Japanese, North American, African, Latin American- as taiko composers have been influenced by all of the musical influences in their contemporary surroundings. Sawagi Taiko's compositions also incorporate many different musical influences, including the Chicago blues, rap, and traditional Japanese folk songs. 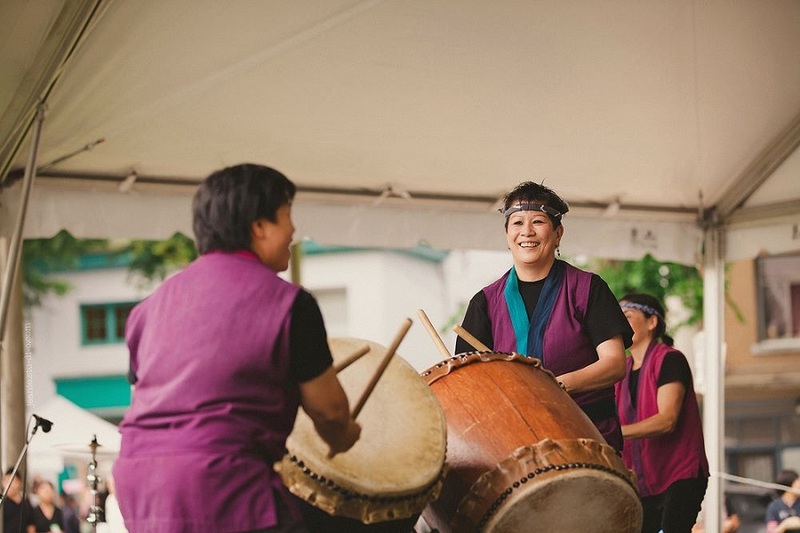 In 1990, the year Sawagi formed, most of the members were already part of Vancouver's Katari Taiko and had several years of drumming experience. 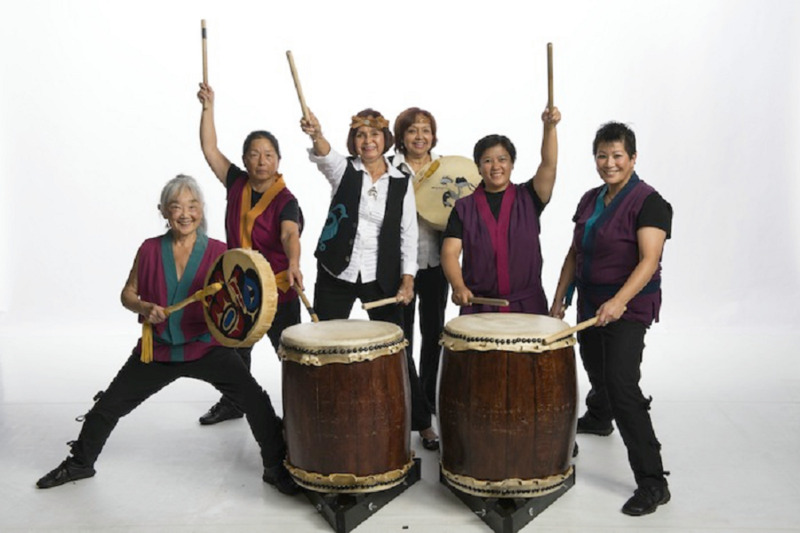 After playing as Katari Taiko at the Michigan Womyn's Music Festival, the members playing thought it would be most appropriate to form a separate all-women's group. Sawagi Taiko was born! Other all-women's groups in Canada include LOUD! and RAW. Since forming, Sawagi has taken part in several women's music festivals and a large variety of other events, locally and across the U.S.A. Over the years, there have been different group members; however, the group has always been a consistent seven or eight members. Taiko is an ancient Japanese form of percussion using large drums. 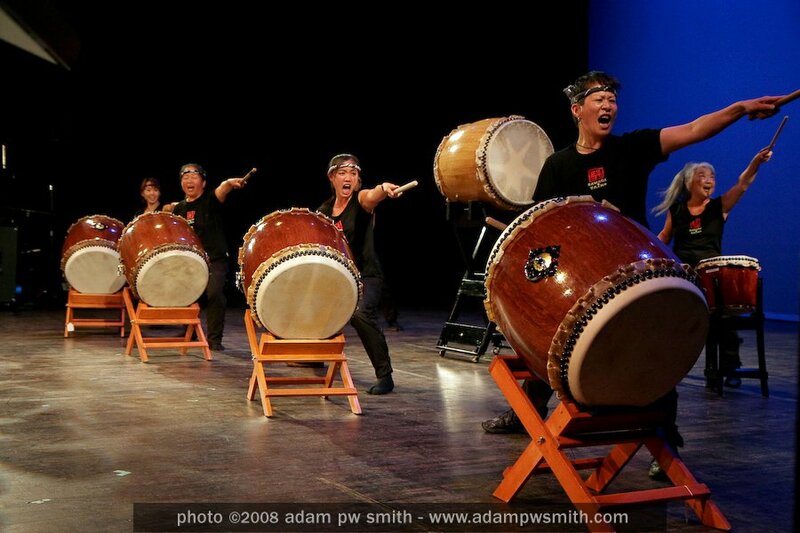 The drums range in size from roughly a snare drum ("shime"), to drums as large as a car (the "o-daiko"). The most common drum size in taiko is the "chu-daiko" which is the size of a wine barrel. The arts have always flourished in the immigrant Asian communities. However, these arts have been buried in the stereotypes of Asians as quiet and hardworking but basically mechanical and uncreative. 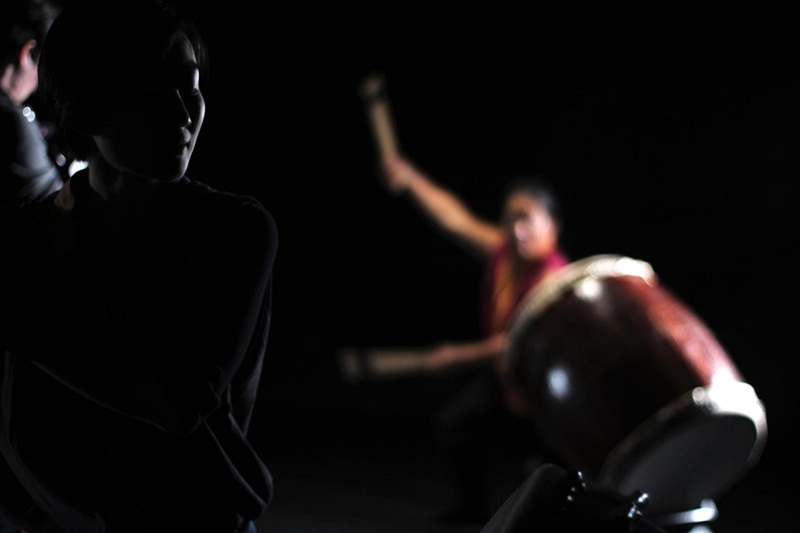 Sawagi Taiko is our vehicle to show the power and creativity of Asian culture, particularly of Asian women. We offer an alternative to the stereotype of Asian women as quiet and demure. As well, the opportunity to work in a group composed only of Asian women is very empowering in North American society. Working from a common cultural basis nurtures a mutually supportive environment in which all members' talents are easily facilitated. In Sawagi Taiko we are exploring a different way of working together artistically, trying to encourage and support each other's creative initiatives. The camaraderie and personal connections that we foster in the group translate into a group intimacy in performance that audiences notice and enjoy. Cat got involved with taiko as a sound technician. Eventually, she was coaxed out from backstage and has now been playing since 1997. For Cat, Sawagi Taiko is an important connection to her Asian heritage. First gig: the Roundhouse in Vancouver. One of her favourite performances was in Alburquerque, New Mexico, at the Kino Theatre. Lisa has been playing taiko since 1987. She began her training with Katari Taiko, and was one of the founding members of Sawagi Taiko. 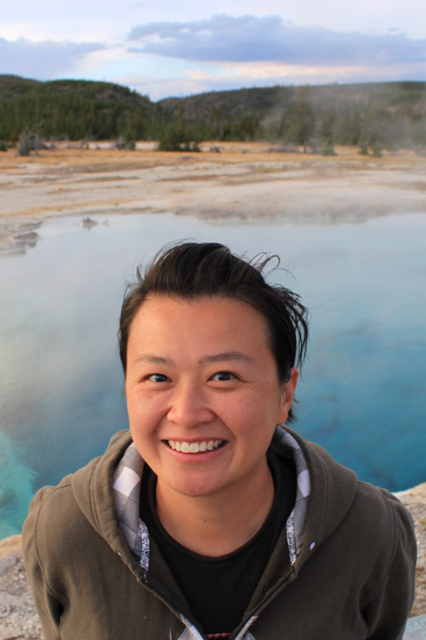 For Lisa, taiko has been an invaluable part of her development in life as a musician, composer, leader and community member. Linda has been playing taiko for a long time. Her favourite gig was at the Michigan Women’s Music Festival when Sawagi Taiko performed in 1990. Watching her perform were her teenage daughter, her 75-year-old mother, and a friend (who also brought along her teenage daughter and mother). Together, they were six Asian women spanning three generations amidst a mostly Caucasian, clothing optional crowd. It was an exhilarating and unforgettable weekend. 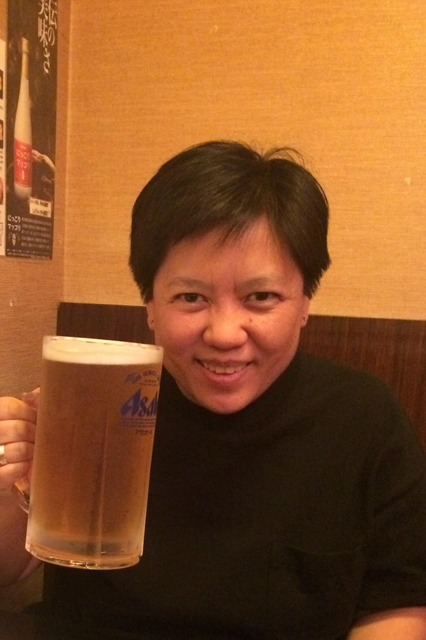 Sachi first became interested in drumming when she was invited to join a taiko workshop in 1987. This was a new yet familiar experience, since Sachi was raised listening to taiko at a summer community festival in Japan. Sachi's first gig was at the Vancouver Japanese Language School. Favourite gigs: the Story Telling Festival in Whitehorse and the Music Festival in Albuquerque, New Mexico. Joscelyn's first taste of taiko was during her younger years when her dad asked her to listen to a taiko cd he had purchased from Japan. He cranked up the volume & the bass; the vibrations shook the walls & Joscelyn's soul. 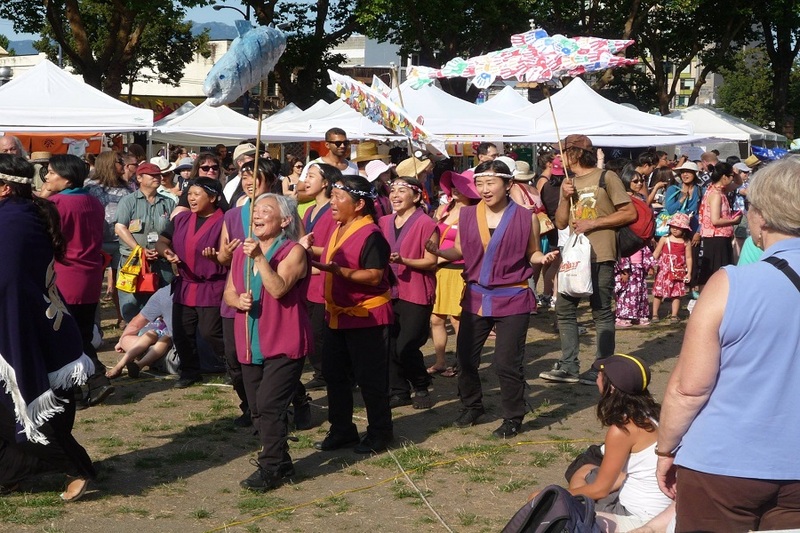 Years later, her love of anime, Japanese food, art & culture, & Sanrio characters brought her to the Powell Street Festival where she heard Sawagi Taiko for the first time. She attended their workshops, asked to join the group, & have been with them ever since. Jeanie heard and saw her first taiko concert as a collaboration with Scottish bagpipes, and was instantly enthralled. Shortly after, an opportunity came up in 2000 to train as a recruit with Sawagi Taiko; she has never looked back since. 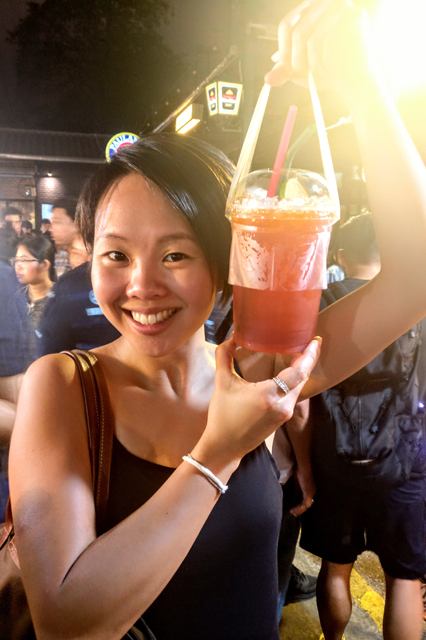 Her favourite festival to play for is the Powell Street Festival; she can't wait to share her passion for taiko and sense of community with her two children. When not drumming with the amazing women who comprise Sawagi Taiko, Jeanie can be found behind a camera, documenting life. Most images on this site appear courtesy of STUDIOjeanie. It was love at first sight when Helen saw taiko performed by Ragin’ Asian Women in Toronto. 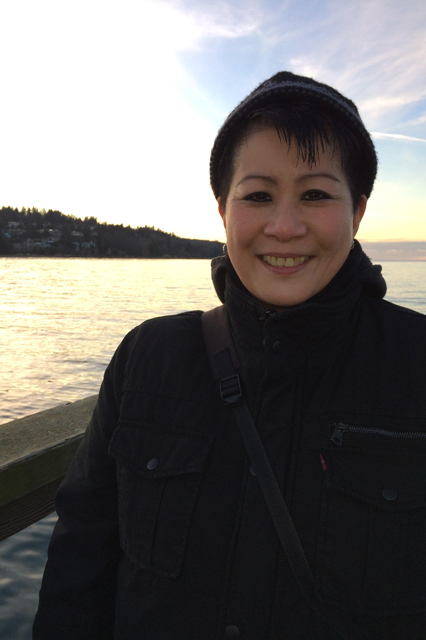 When she moved to Vancouver, she joined Sawagi Taiko to experience the drum herself. 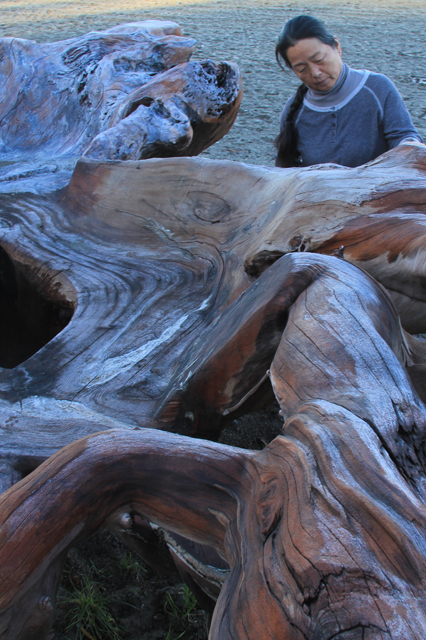 Taiko brings together her two passions—art and community-building. Plus, every week she gets to drum, sing and laugh with such an amazing and fun group of women! Anita joined Sawagi in 2005, not knowing what she was getting into. 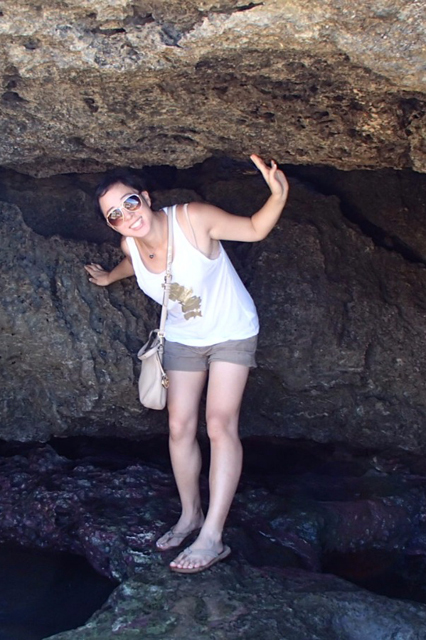 Her main intention was to reconnect to her Asian roots, but also because it seemed REALLY COOL from what she found other people doing. While Anita currently takes periodic work hiatus, she always makes it a point to come back to her drumming family. Kathy was inspired to take her first taiko workshop in 1987 after seeing Hinode Taiko perform at Folklorama in her hometown of Winnipeg. 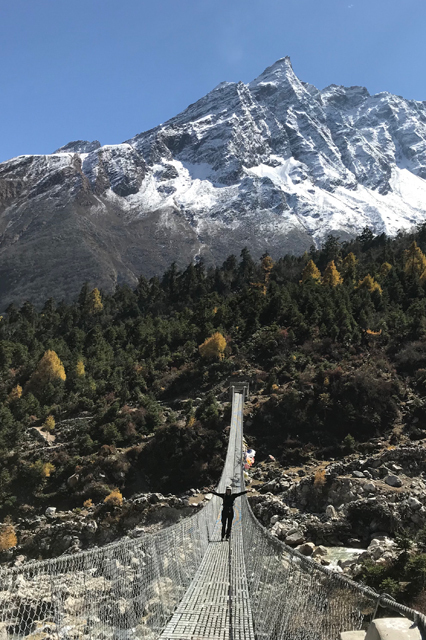 After the workshop, she joined the group and her life changed forever. 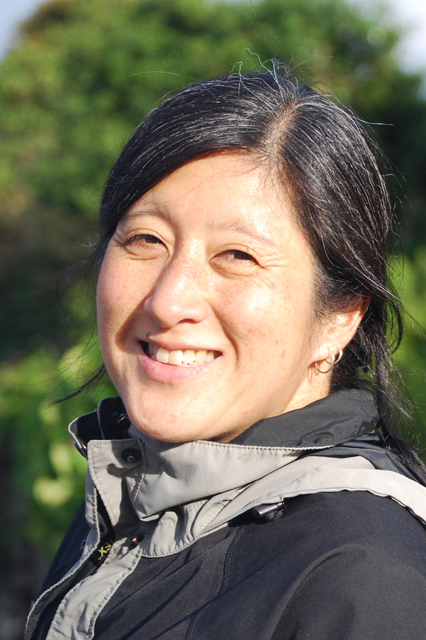 After moving to Vancouver in 1990, she joined Katari Taiko, and then Sawagi Taiko in 1995. 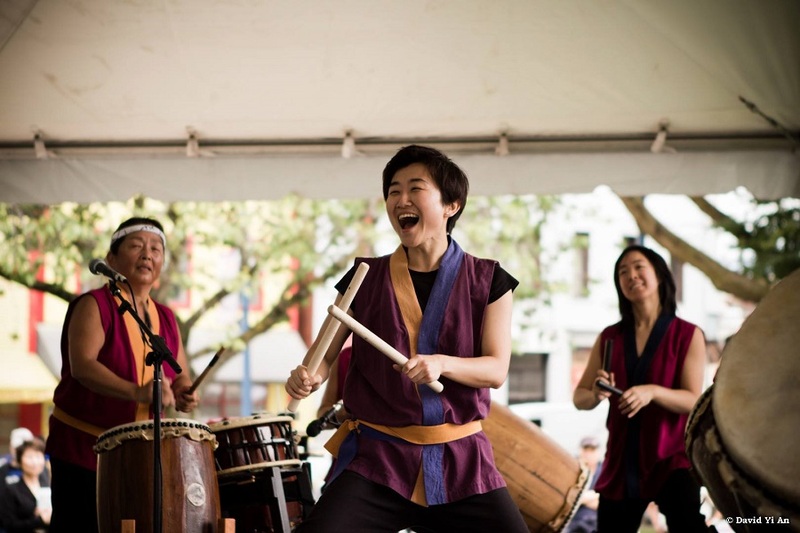 Now she dedicates her taiko energy to Sawagi Taiko and the rest of her energy to the Powell Street Festival, WePress, and Asian Americans United working for social change and justice through art and advocacy. Anny has always been drawn to the world of percussion, and started studying African music and dance under Albert St. Albert Smith in 2007. She came across taiko in the summer of 2014, and studied with various taiko professionals throughout North America and Japan. 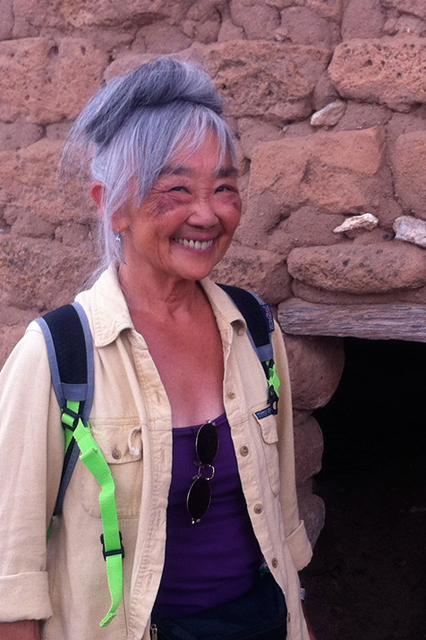 Sawagi Taiko has taught her alot about community and leadership. She is honoured to be part of such a high-spirited group and is thrilled to perform together with them. Playing music has been a big part of Felice's life for as long as she can remember. And from the moment she first saw taiko, she knew she had to play it. 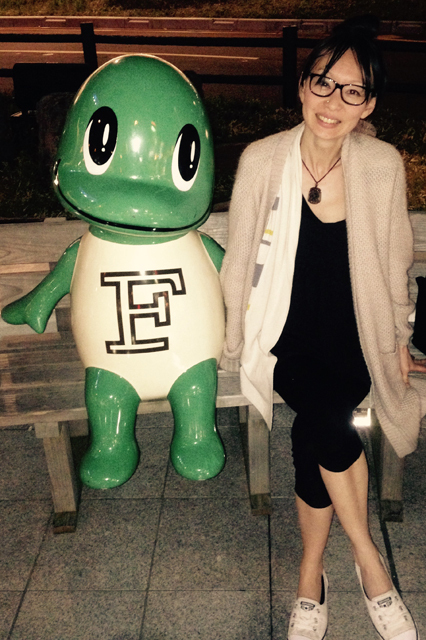 Felice takes great joy in performing with Sawagi Taiko, and sharing her passion for taiko with the community. When Fin first took a workshop with Sawagi, she never dreamed that she would one day have the honour of joining them. 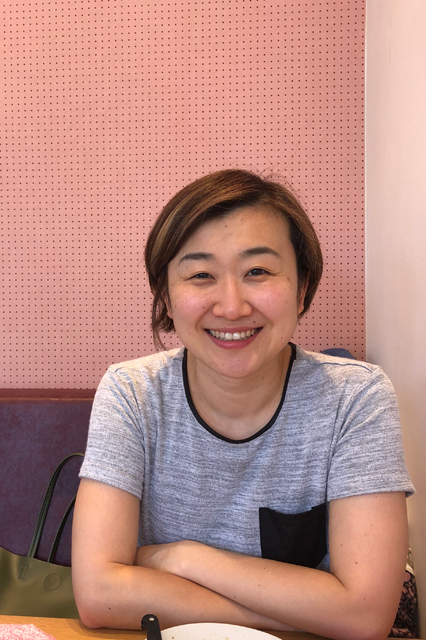 For Fin, who has never learned an instrument or performed music, Sawagi is a source of great inspiration and joy, and she counts herself very lucky to play taiko with such a talented and empowering group of women. 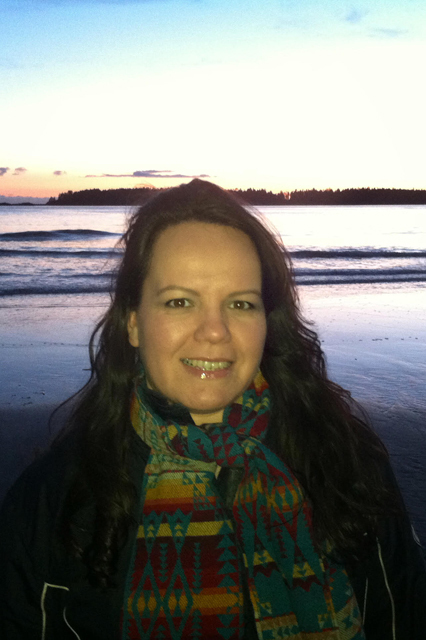 Wenonah Justin is from the Nlaka'pamux/ Nehiyaw First Nations. 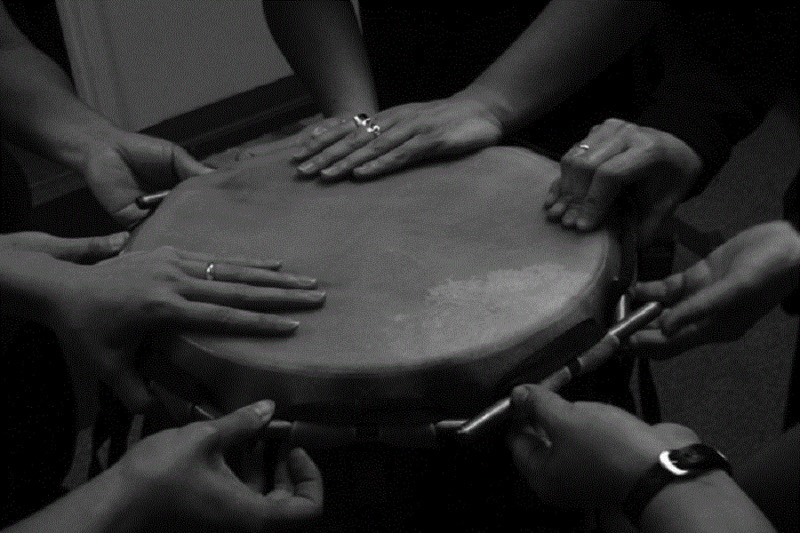 Wenonah first learnt about taiko during a collaboration workshop in 2008 with Tiqilip Community Singers. When Wenonah hit her first "don", something woke up inside her. She continued to eagerly participate with collaborative performances and Sawagi's workshops. In 2017, she proudly became Sawagi Taiko's first Indigenous member. The Drum is Calling Festival in July 2017, is one of her most memorable performances. Jen joined Sawagi Taiko in 2013. 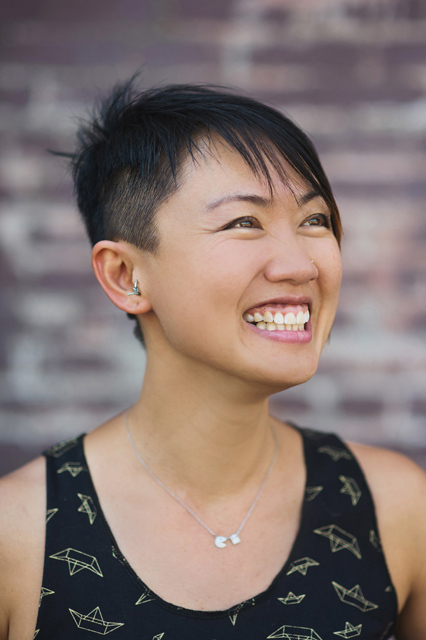 For her, taiko combines her love of music, movement and artistic expression. 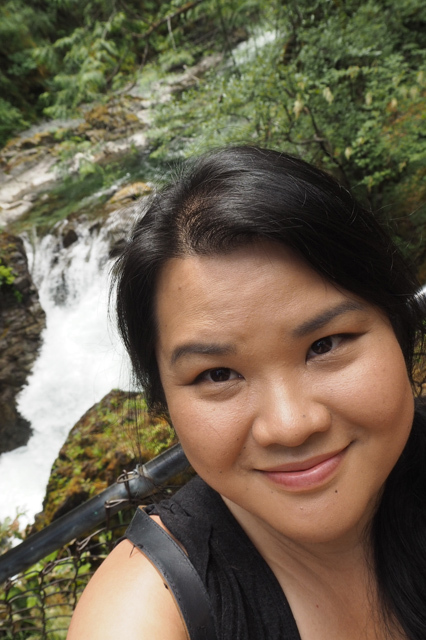 Jen has fond memories of enjoying taiko at many Powell Street Festivals and was instantly drawn to the powerful connections between the drum, group members and communities. 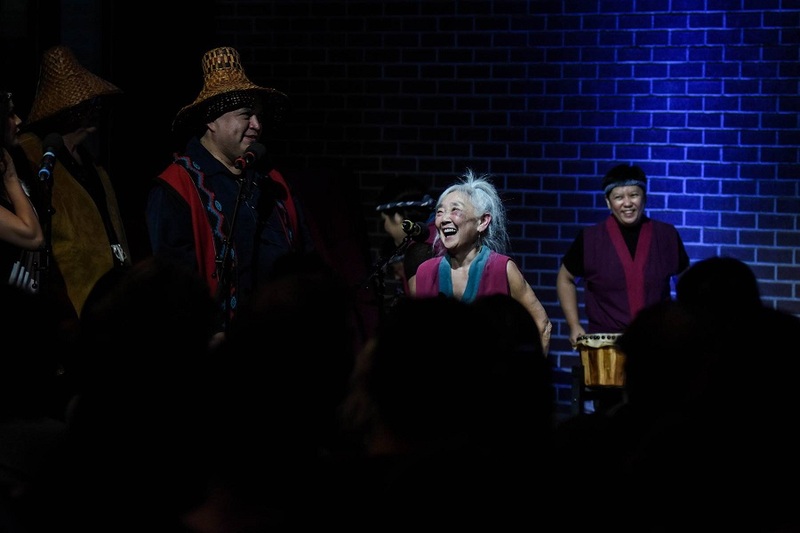 Some of her favourite performances have been collaborations with Salish music ensemble Tzo'kam. Stay tuned for more information about upcoming workshops. 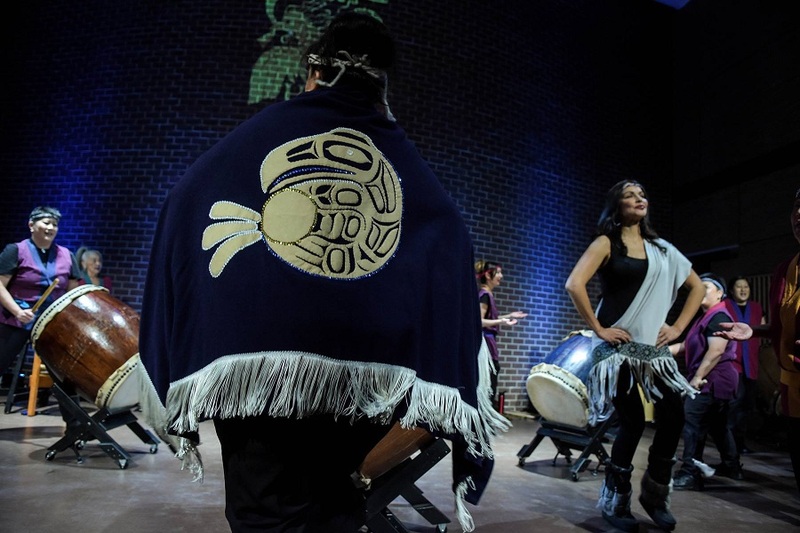 Performance at Nikkei Heritage Centre, Burnaby, B.C.